You are currently browsing articles tagged English Ford. 1963 Volkswagen Beetle. Black. 1200cc engine. Belonged to my parents. Rolled it during summer school after my freshman year in college. In fact, it rolled over three times before coming to rest right-side up. I remember trying to hold onto the bottom of the seat, watching the pavement come up to the window and disappear overhead, over and over again. I was fine, but the bug was totaled. Still, it brought $425 at auction from a guy who cut it in two and attached the front end of it to the back of another one. New it was $1250 or so. 1960 English Ford Consul. Black. Leaked oil from everywhere. Bought it for $400, sold it for almost nothing, which is what it was worth. The low point came when it croaked in Hickory, NC, where it limped after the alternator belt blew up on the Blue Ridge and where no replacement could be found, so we had to hitch back to Greensboro. In the rain. As I recall no belts could be found to fit around the alternator pulley, and for awhile we used some nylon hose tied into a loop. 1958 Mercedes 220S. Midnight blue. Bought it for $250, needed new upholstery, which I put in. Had a “hydrax” semi-automatic transmission. 4-on-the-column, no clutch. The couchlike seats reclined all the way, making the interior into a double bed. This made it a very romantic car. Alas, the transmission went bad, and I sold it for $75. 1963 Chevy Bel Air. 283 V8. Rochester carb. My parent’s old car, and the first new car they had ever bought. Drove it to 125,000 miles, when the transmission started to go. Sold it. 1966 Pugeot 404 wagon. Bought for $500. Had dents in all four doors, and lots of stupid “features” such as screw-on hubcaps and spark plugs hidden down inside the valve cover at the far ends of bakelite sleeves that would break. Got rid of it after driving it from New Jersey to North Carolina, in the middle of which a resonator can on the exhaust manifold blew off; and, in an unrelated matter, large hunks of the floor between the front seat and the pedals fell out, so I could see the pavement under my feet, hear the engine noise bypass the exhaust system, and breathe the exhaust, all at once — for another 400 miserable miles. 1966 Volvo 122S. Bought it from my parents, who bought it new in Belgium . Great car, very solid. Ran out of oil once, however, and damaged the engine. Sold it with 110K miles on it to a guy who replaced the engine. 1967 (?) Austin America. Belonged originally to my sister. Loaned from my father, who later sold it for almost nothing, which is what it was worth. An early front-wheel drive, it had lots of good ideas but terrible construction. I think Pop sold it for $10. 1971 (?) Datsun pickup. My father’s, actually. But I drove it for awhile. It had two sets of points in the distributor. Very confusing. Mastering those helped me later when I had a girlfriend with a Datsun 610 wagon. 1969 Chevy Biscayne. Snot green. Black vinyl seats. Looked like an unmarked cop car. Developed leaks in the roof. Turning on the heat would steam up the windows. Don’t remember how I got rid of it. 1978 Volkswagen Squareback. Bought it from a buddy for $200, sold it for $225. Something like that. My buddy and I fixed it more often than we would have, had not beers been involved in prior fixes. A few months after I sold it, cops showed up at my door to tell me I needed to get its corpse out of the woods, where somebody had set it on fire. Still had my plates on it. Fortunately, I had the paperwork for the sale. No idea what happened after that. 1969 Pontiac Catalina. “Big White.” Bought if from my uncle. The trunk would fill with water in the rain, making it useless for carrying stuff in there. Not sure what happened to that one, either. 1980 Chevy Citation. The famous “X car”, created to compete with Chrysler’s equally bad “K car”. It had front wheel drive, which was new in those days, and a roomy sloping hatchback. But it was crap and didn’t last long. Gave it up in a divorce, in trade for my ex’s old Pinto. 1974 Ford Pinto wagon. One of the worst cars ever made. This one had been in an accident at some point in the long prehistory before I came into possession of it, and the frame was bent, so it moved crabwise down the road. Every once in awhile it would start to veer wildly out of control, even on the straightaway. It did this once on the boulevard between Chapel Hill and Durham, hooking bumpers with another car, sending them both spinning. Fortunately, the Pinto’s bumper bent completely while the other hardly had a dent, which was both strange and amazing. The lady driving the other car wanted money anyway, and I paid. At some point the car just died, as best I recall. 1985 Toyota Camry. Basic model with a stick. My first and only new car, and the first that had working air conditioning. Best car I ever had. Gave it to my daughter when I got the Subaru in the early 90s. I think it went way past 300,000 miles. It may still be working, somewhere in Santa Cruz, which is where she gave it away. 1986(?) Subaru 4Wd wagon. Tried to drive it into the ground but failed and gave it to a friend earlier this year. It’s still going. I’m sure I’ve forgotten a few, but that’s an outline for countless stories. [Later…] Fun comments below. By far the most entertaining (or frightening, or both) pointage out goes to the Head Lemur’s list. Wow. Reminds me of Hot Rod Lincoln, one of the Great Gassed Insanity Songs. Those linked lyrics, by the way, are from the Commander Cody version. The Commander gives the definitive performance of the piece (I just went through the karaoke exercise supported by the audio at that last link, and The Kid said he was glad “nobody was here” to hear it), although full props go to George Wilson for writing (and living) the original. [August 2016 update…] Still driving the same VW Passat wagon, nine years later. It has 206,000 miles on it and runs like a top. Hasn’t needed much work in recent years either. I should add that my wife is still driving the 1995 Infiiniti Q45 that she bought used for $5k after her 1992 Q45a died, around 2004. That one has about 200,000 miles on it too. [January 2019 update…] The Passat died of a bad transmission (or so we were told) last Spring. We sold it for $125 to a guy who replaced the transmission fluid and told me it ran fine after that. I haven’t kept up, so I don’t know, and don’t want to know. It has been replaced by a 2005 Subaru Ouback with 85k miles. It’s fine so far. Then last Fall the Infiniti died too. Fuel injection. We donated it to a local public radio station and haven’t replaced it. 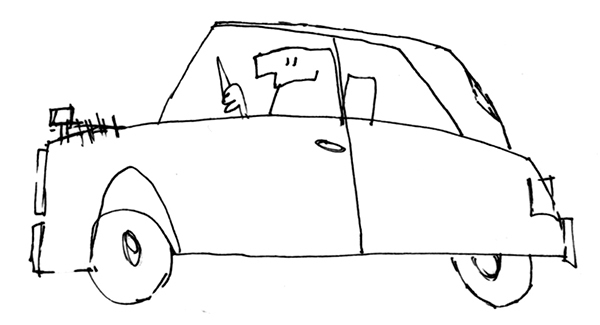 For the price of even a beaten up used car, renting and ride sharing are far more economical.